This interview, the last ever granted by John Brahm, was conducted in July of 1979, and arranged for me by master puppeteer Eric Von Bulow. The creator of the Pillsbury Doughboy and the terrifying Zuni Doll seen in Dan Curtis’ TRILOGY OF TERROR (1975). Von Bulow was a fellow countryman of Brahm’s and introduced me into the close-knit colony that gathered on summer weekends at Brahm’s unique Malibu cottage on three acres high above the Pacific Coast Highway. Then in his 80s, Brahm was confined to a wheelchair and, being an avid sun-worshipper, stayed on his patio deck as long as the sun was out. This made the interview sometimes less than comfortable to do. His memory seemed vague at times but, more accurately, it was selective, eliminating whatever was not of particular interest to him. Fortunately, his beloved films THE LODGER and HANGOVER SQUARE were not only of interest to him, but also of great personal importance. Two of his most cherished possessions were the 1944 reprints of the celebrated novels by Mrs. Belloc Lowndes and Patrick Hamilton with their colorful movie tie-in dust jackets. Mr. Brahm, would you mind discussing the making of your films THE LODGER and HANGOVER SQUARE? As long as this interview doesn't turn out to be 'The Laird Cregar Story' (LAUGHS)! Not at all, but it concerns me that Laird Cregar is becoming a sadly overlooked figure in film history. His performances in both films are unique. What do you remember about him? Laird Cregar was a quiet, sad, aloof sort of man who saved it all for the camera. We could not have done HANGOVER SQUARE if his performance had not been so amazing in THE LODGER. 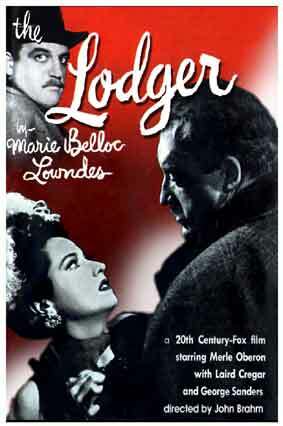 How did THE LODGER come about? BLOOD AND SAND, his remake of the Rudolph Valentino silent. Right, right. Well, Cregar was quite obese and seemed older than he was, yet this sinister quality was always there. Cregar was already cast when I came on the picture. Darryl Zanuck was still on duty in the Signal Corps, so Barré and I worked out some details uninterrupted. Of course, when he returned there was hell to pay! involved in the creative process? Zanuck, for all his faults, was worth 10 of what you call 'Studio Heads' today! Darryl dominated every production on his lot. He lived and breathed pictures. And his ideas were usually right. If your ideas worked better than his, he would say, "Okay, alright.." But Zanuck was also allergic to art or anything too grand or pretentious. I liked that aspect of the man. 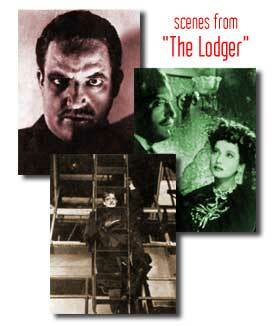 Had you seen Alfred Hitchcock’s silent version of THE LODGER (1926)? I don't know; I might have. I met Hitchcock once or twice in the early days. Hitchcock visited the Fritz Lang sets at UFA in those days. You can't help but sense a UFA quality in your version, with the eerie sets and dark atmosphere. My early years were spent in such a way that dark atmosphere came naturally. My uncle, Otto Brahm, was very respected in Germany as a theatrical producer around the turn of the century, and through him, as a boy, I saw productions of FAUST and Die Niebelungen. I was fascinated with the dark and fantastic, even as a child; the Puppenspielen (puppet shows) that came to town would always play Faust and the Devil. Vincent Price, who worked with you on THE MAD MAGICIAN (1954), told me that you always came to the set with your day's work sketched out beforehand. Did you storyboard all of your films? Oh, yes. I was known at Fox as a maniac for doing complete sets of blueprints for every shot and camera angle before shooting took place. There was no time for mistakes, and when your script is good and your actors know their craft, work is less of a nightmare. In THE LODGER, Fox had first-rate people and Barré Lyndon made simple notes for camera movements in the script. All the set director had to do was follow script direction and be creative. I was always fond of a specific detail in THE LODGER, where we see the Ripper bathing his hands in the Thames after a murder, as a kind of cleansing gesture. Was that scripted? Laird Cregar, you'll be pleased to know-said that the Ripper would do this as a kind of religious ceremony to ease his conscience. Cregar was so in tune with the character, that he basically improvised that bit on the set. Laird was magic to direct in this, to say the least. How did Merle Oberon come Into the picture? There is absolutely no basis for her character in the novel. Merle shouldn't have been in THE LODGER, really, but she had just married our cameraman! I recall that Zanuck vetoed the idea of the Ripper killing prostitutes, so the ladies he killed became actresses instead! Merle was cast as a music hall singer. In the second film, Linda Darnell played her singer so much like a prostitute that the notion surfaced anyway, whether Zanuck liked it or not.